Do you think that Agatha Christie has “A Talent for Murder?” – Joyce's mystery and fiction book reviews with some non-fiction too! 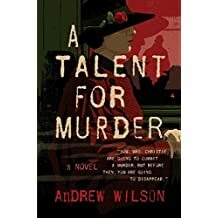 In this novel, Wilson writes about what might have happened to Agatha Christie during the time that she mysteriously disappeared for ten days. Using known facts and his imagination, the author creates a fascinating, if somewhat unbelievable explanation, for what transpired. Best in this book are the biographical facts and insights and the development of characters including Agatha, Archie, Nancy, Una and Davison. Recommended for fans of Agatha Christie’s books or those interested in knowing more about the author and her times.